Looks good, right? Great, I innocently thought. Finally, something to get bullish about! Hey — the Obama administration might have some constitutional problems with the extrajudicial killing of American citizens — but at least he’s addressing the issue of external oil dependency that I have long believed is one of our most grievous. But why — if Obama is successfully addressing the problem of foreign oil dependency — are gas prices so high? The trouble is, Obama is being — shall we say — liberal with the facts. 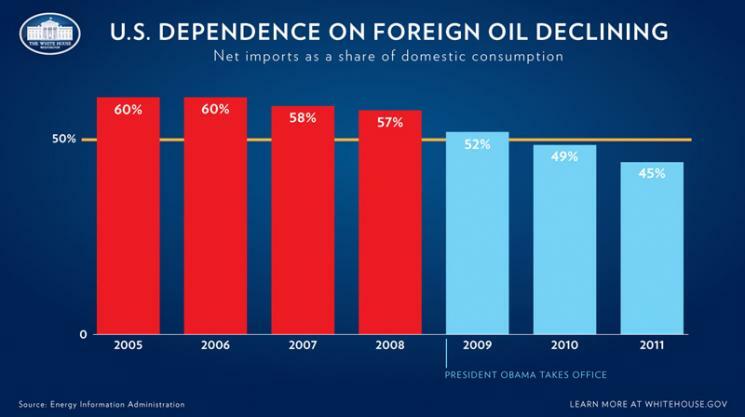 President Obama absolutely did not cut dependency on foreign oil. 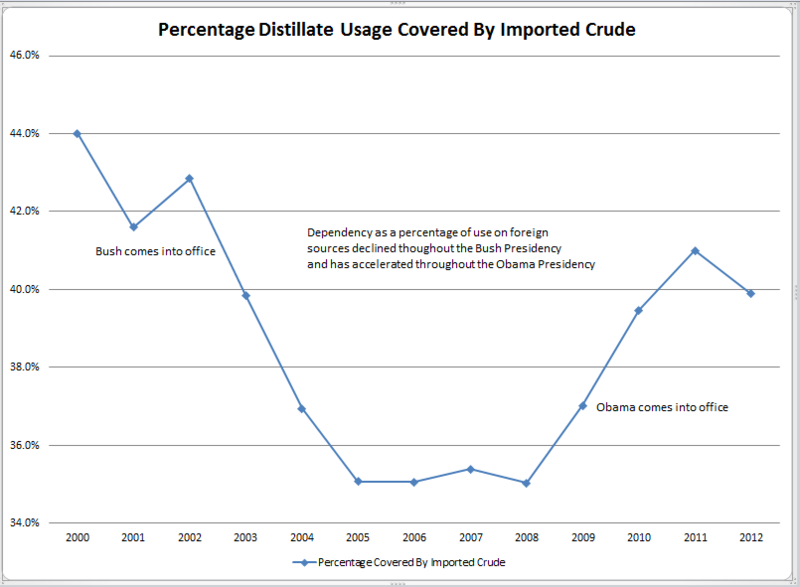 In fact, foreign oil dependency rose from roughly 37% to 40% under his administration. To be more precise, foreign petroleum usage in his administration went from 37% to a peak of 41% last year, currently at 39.9%. So just what is Obama taking credit for? The only way Obama can take credit for the decline in consumption caused by the recession, is to take credit for the recession itself. Falling foreign oil consumption appears to be as a result of economic contraction. 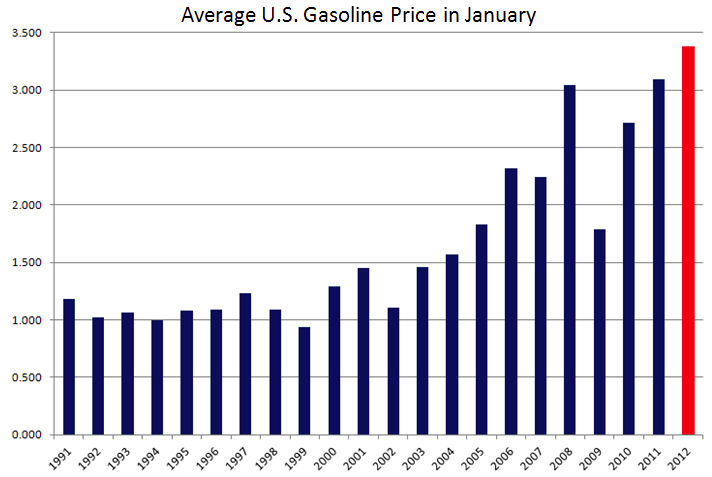 The scary thing is that consumption has dramatically fallen, while gas prices continue to rise. How high would they be if consumption had not fallen? And how much will consumption have to fall to stave off further rises? This entry was posted in Current Affairs, Economics and tagged fail, gas prices, light sweet crude, nope, obama, oil dependency. Bookmark the permalink. Give him a break he is just trying to keep his campaign promises. I wish more people paid attention to his words and less to his body language and smile. Same thing for G.W. Bush’s carpetbagging “downhome” Texas mannerisms. Enshrine into law that war-time leaders must lead their troops in battle. Here is another good one. I know sometimes you and I both question Warren Buffet but he made a rather insightful comment to Becky Quick. BUFFETT: I can end the deficit in five minutes. BUFFETT: You just pass a law that says that anytime there’s a deficit of more than 3% of GDP, all sitting members of Congress are ineligible for re-election. Yeah. Yeah. Now you’ve got the incentives in the right place, right? Buffett is good at playing both sides against each other. He had/has no problem bringing Berkshire to the trough of free money. Making Berkshire a bank holding company in 2008 was a joke. They had plenty of cash to weather the storm in 2008, but gasp, Berkshire’s stock price might have taken a big hit and Buffett might not be known as “The Oracle” today. On a side note, Buffett has many of the qualities of the early 1900’s German industrialist Hugo Stinnes. I actually disagree with these kinds of balanced budget amendments. I think that at some times (i.e. during recessions) government spending should probably rise to counterbalance the fall in private expenditures. My personal contribution to this debate is that there should be a balanced budget law over a longer period, say 20 years, and violating that law would (as Buffett suggests) make all Congressmen involved ineligible for re-election. In Sweden we have something called överskottsmålet, the surplus target, which was instituted after the crisis in the 90s and has been upheld religiously by all governments since. It mandates that the government should always run a budget surplus of approx one percent per year – on average over an economic cycle. This allows for extra spending in troubled years, but requires that this is compensated by extra saving when times get better. Granted, it’s a bit of a fuzzy target, since economic cycles aren’t clearly defined, but it has worked very well for us this far. See the Swedish are smart people. They adopt Keynesian principle the way John Keynes imagined them. This is what I think all Governments should do. Save in the good years to spend money on frastructure projects in the bad years, absorbing unemployment. Then business would not suffer rising employment costs. As long as these workers return to business building commercial property etc. That is very interesting to learn that there is already such a thing as a balanced budget provision over the full economic cycle. We would do well to learn from Swedes. Perhaps that is one reason why your fiscal situation is comparably much stronger. I will do more research. The U.S. is still a very big consumer, and certainly is the biggest consumer in LSC hemisphere. The fact that U.S. demand is lower than Eurasian demand would seem to be reflected in the spread that has opened between LSC and Brent. And gas prices are still very high for Americans. Of course Sweden was very quick to nationalize their banks when the SHTF. That kind of move lets a nation get a leg up on a collapsing economy — literally overnight. America does not have the authority to take such action. Natural Gas is awefully abundant in the USA and cheap on world markets at the moment, but once it can be utilised, watch pricing increase. I have long wondered what any American president has to do with the price of oil. It’s not like oil is nationalized. America is one of the few oil-producing nations whose people do not own their own natural resources. In effect, the oil exploiters in the US are privatized. Americans pay retail to buy their own oil — along with a couple of other unfortunate third-world colonies. As for futures in the commodity market (aka speculation) — it’s not like the United States has any control over a 24-hour-per-day global market. Most of the key traders and price drivers aren’t even in the US — and certainly not trading through US brokerages. What’s a poor American President to do to bring down the price of oil? Here’s a thought: Stop threatening to attack Iran. That could work wonders overnight. 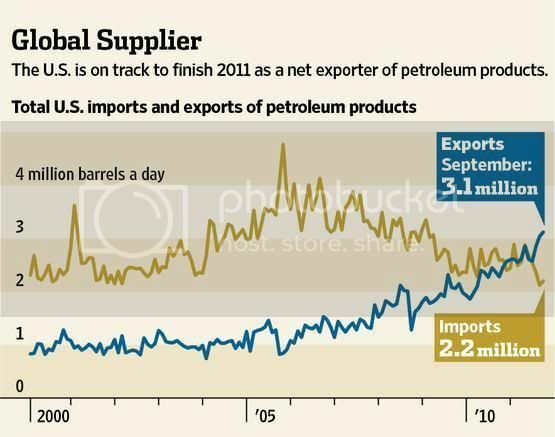 US becomes a net exporter of oil in 2011. 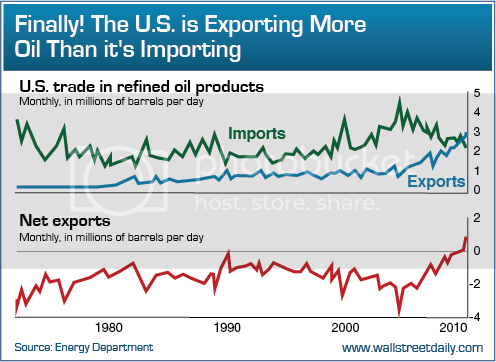 US exports more oil than it imports. Little wonder there is a frantic rush to drill. Its not oil we are exporting, its the refined products (gas) that we are exporting. Why? I do not know. Its not oil we are exporting, its the refined products (gas) that we are exporting. Due to dropping US demand, there’s plenty of refining capacity for the oil cartels to add even more value and profit to domestic oil exports. Local well paid employees trained in a Government Mining University. When the Minerals run out we’ll have world class schools to train other Nations. You have to look ahead right? We ship our profits from our vast resources to our foreign masters. My political party I am developing, has Nationalisation with Corporatisation. Buddy, that’s the win-win ticket — as far as I’m concerned — for the 21st Century. Public/private partnerships that bring in a tide that lifts all boats and prepares the nation for the challenges of the future. Healthy, educated, secure, and confident — as an entire nation. That’s what global leaders of the future look like. while oil price surge is surely inflationary to some extent, I don’t think observed levels are all due to commonly defined inflation. I thnik we’re looking at a local mini-bubble. everyone is talking about gasoline prices, all over the world. people are protesting against energy taxes. MSM talk about it every three days. even governments stopped denying the numbers (which is their primary response to numbers going against their will) and started fingerpointing. banksters issue recommendations to go long oil futures. lookls like Goldman-engineered pump-and-dump scenario. oil price is more sophisticated than Big Mac Index. 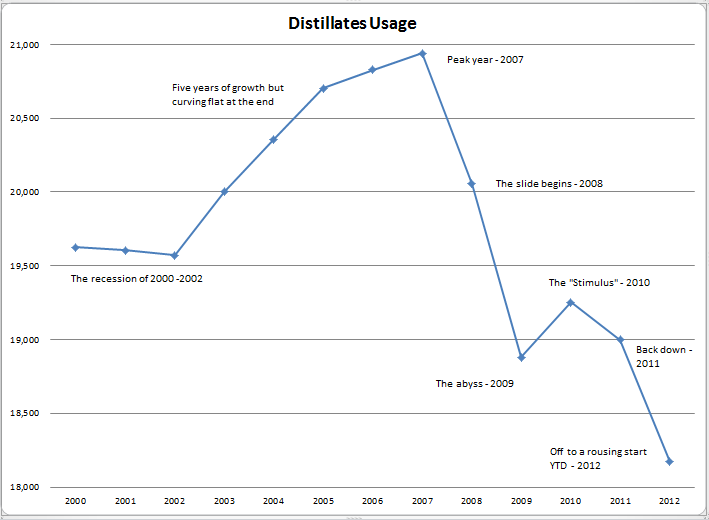 it has a built-in suppression mechanism: high price stifles economy reducing demand and ecouraging drop in prices. to transmit inflation (or hyperinflation) there must be high bidding activity. low bidding activity will prevent the economy from passing a certain threshold above which price levels stay with us for good. banksters issue recommendations to go long oil futures. looks like Goldman-engineered pump-and-dump scenario. Plausible. But with the global economy structured the way it is, there will always be a bid for oil. Aziz, a friend recommended your website to me and you seem to be quite knowledgeable. Unfortunately I feel like I may be missing a basic and fundamental understanding of Econ: when people say we send the refined oil (gas) to export, this is bad because the cost of the refinement falls on consumers and oil execs reap the profits? Or why? Thanks!! Hi Jon, sorry for not responding earlier. I was giving Pluto a chance to respond, because he had raised the initial point. I’m not sure I want to refer to this practice as “bad”. The point is actually that exporting the finished products is a result of market forces. In other words, external countries are willing to pay more for what we are refining than we are. So the products that are coming in are being refined and processed (and contributing to US GDP), and then shipped off to other places to be used. The point of my initial post was that overall America is still dependent on foreign oil, for domestic demand, and that is still the key figure. This includes the stuff that is then shipped off to other countries once it has been processed. The point about America exporting finished products is kinda troubling because clearly a lot of domestic energy and domestic work has gone into refining products which are then washed away from America’s shores on the tides of foreign dollars. The troubling thing is that America is being out-competed for products that it is refining, even while gas prices and refined prices (e.g. plastics) continue to rise in America! It’s not like America is manufacturing too much and exporting the difference! It’s a symptom of America becoming economically weakened.